Last week, Fortune Magazine published a most interesting article on the Chinese high speed rail project. By 2020 over 25,000 km (16,000 miles) of new tracks will be built for a cost of $300 billion (210 billion €). The People’s Republic government launches this huge project to answer to it’s citizens’ needs of alternative to cars and fast transportation, create million of jobs and spur economic growth. 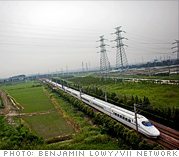 This takes place as the United States want to create ten corridors of high speed rail. However, the allocated means – a mere eight billion dollars – won’t complete this project. As there is a peaceful arms race over cleantech and renewable energies could there be one over high speed rail ? Could China, India, the United States and the European Union (as well as other nations) compete in this domain ? Low carbon, fast and reliable way to go from a city center to another. For more about the Chinese project and how it could transform the country, please check out the facts and figures provided by Fortune Magazine. ← The end of urban sprawl ?